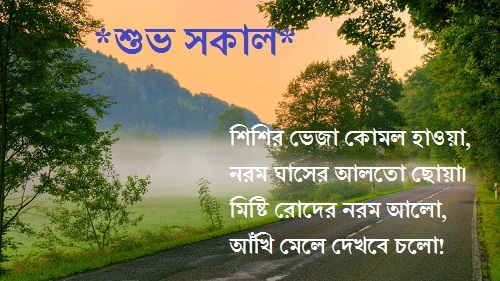 Some best bengali good morning quotes and sms are collected here for all good morning wisher. 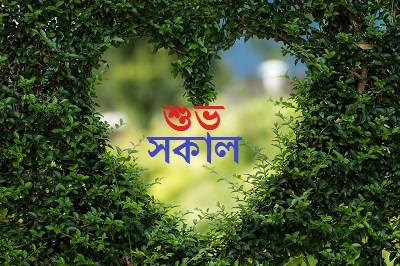 With a best bengali good morning quotes you can express your real love with your beloved one. Every morning is the best time for wish your friends. I think no one should not spent morning time without any wishes. The best and romantic way to wish someone in the morning, quotes and sms are best and nice way. 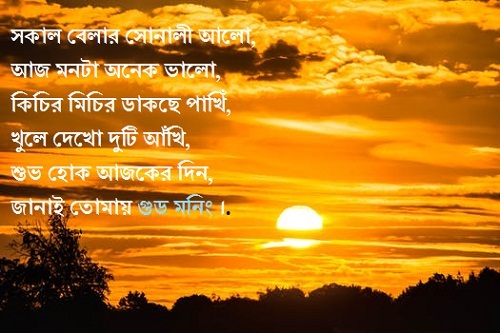 Here you will get some romantic bengali good morning quotes and sms with awesome images and pictures. Just share these quotes and sms with any one. Good Morning Sms . Ki bepar, tomar chokhe ekhono gumer ghor ? Chilo just aamar “good morning”. Oma ! Eta Abar Ki Holo ? Taratari Uthe Jaw SMS Ta Rode Daw. SMS diya janiya dilam amar ontorer tan. Sobai ke janai Assalamu alaikum. mistii sokal janiye dilam, chotto sms a.
Snigdho alo roj shokale, Achra pore nire. Shuvo shokal pouche dilam, tumar moner tire. suprovat mane ki jano ? S: somoy goriye sondha howa. U: ushar alo miti miti kora. P: priyo jon k shopno dekha. R: rat sesh kore bhor pawa. O: okkhir nay akhi mela. V: vorer pakhir gan sona A: amon keu thaka. T: thik thak tar kach theke suprovat shona. kichu notun shopno. kichu notun asha. kichu valobasa. kichu chawa. kichu valo-laga niya tomake bolchi shuvo shokal. 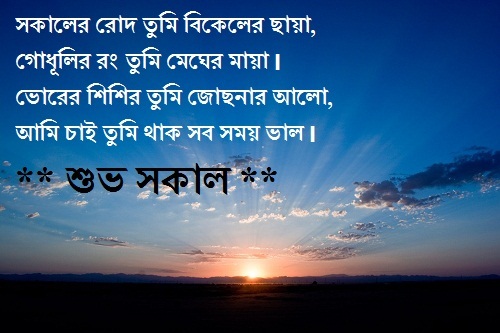 Shokal holo _ noyon kholo… Ghum k bolo ari…! Amar sms pouche geche,, bondhu 2mr bari…! Fuler gonde bhore uthuk tomr sajh sokal…! Taito tomy janai _ mishti shuvo sokal…!